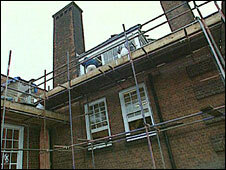 England's school rebuilding scheme could result in thousands of poorly designed schools, a watchdog has said. The Commission for Architecture and the Built Environment (Cabe) rated 87.5% of Building Schools for the Future designs "mediocre" or "not yet good enough". It rated just three of 24 designs it checked "good" or "excellent". Schools Minister Jim Knight said good design was absolutely paramount and that changes had been made to the design processes involved. So far only 13 schools have been newly built or refurbished under the £35bn Building Schools for the Future (BSF) scheme, but it is hoped that every one of England's 3,500 secondary schools will benefit by 2020. Cabe said some of the designs seen by its schools design panel, which helps local authorities make the best choices for their newly designed schools, got the basics wrong. They featured poor site planning and school grounds dominated by car access and parking. This made some designs look like "edge-of-town retail parks rather than lively educational establishments", Cabe said. There were few designs with a "well thought-out approach to sustainability", it added. The design watchdog also said some proposed designs featured secluded yards that could become bullying hotspots, and noisy, open plan areas that could make teaching difficult. But the best designs were getting it right by using plenty of natural light and creating lively spaces for learning, it said. Cabe has been running its schools design panel for a year. It said of the 24 schemes that were now at the planning application stage or with a design team in place, 21 were rated either "mediocre" or "not yet good enough". Only three were rated "good" or "excellent", it said. The scores were worked out using a set of criteria including use of outdoor space, how safe pupils might feel, the adaptability of space and how it aids teaching and learning. Cabe chief executive Richard Simmons said the design quality of schools it had reviewed so far had not been high enough. "What we need is a design threshold to prevent bad schemes from continuing through the system. "This would provide a very clear signal that good design is a core requirement of BSF, not an optional extra. "It should not be acceptable for public money to be used to procure poorly designed schools." It is not the first time Cabe has criticised the school rebuilding programme. In June 2006, it warned that half of a sample of 52 secondary schools built in England in the previous five years had been at best "mediocre". But Schools Minister Jim Knight insisted his government did not build mediocre schools. "The fact is that most of these designs are at initial planning stage and they are all improving massively as they advance through the planning process. "Cabe itself told the select committee last week that our changes to the design process will mean that better schools will emerge rapidly in future." A Department for Children, Schools and Families (DCSF) spokesman said it was looking carefully at introducing a minimum design threshold in BSF and that it was working with Cabe and others to explore how to establish an agreed objective set of measures. A spokeswoman for the non-governmental body charged with overseeing the programme, Partnership for Schools, said it was working with Cabe, the DCSF and others to ensure design quality is safeguarded. She added: "High-quality school buildings which provide safe and inspiring places for students to learn and for teachers to teach are absolutely central to the success of BSF. "That is why we have been working closely with Cabe's enablers - who have offered expert advice to all local authority BSF teams - as well as its review panel, which has more recently tracked how design proposals are faring."